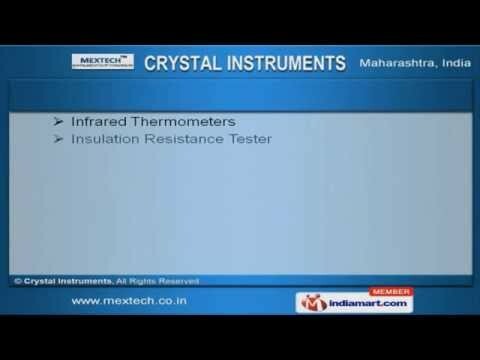 Welcome to Crystal InstrumentsTrader of Laboratory Testing EquipmentsThe company was established in 2009, at Mumbai. Our Stringent quality checks & completeclient satisfaction make us unique in the industry. Global quality standards, Timely delivery & spacious warehousing facility are the factors thathelp us to stay ahead of our competitors. Our product list covers Digital Clamp, Automatic Anemometers & Coating Thickness Gauges. Hour Meters, Data Loggers & Frequency Counters are also offered by us. We offer Moisture, Lux Meters and Shore Hardness Testers that are best in the industryamongst others. Our Industrial Stroboscopes, Vibration Meters & Digital Tachometers are well known for theirimpeccable performance. We also provide Transistor Testers, Weather Stations & Carbon Monoxide Meters that areextremely reliable. Along with that we offer Digital Multimeters, Transistor Testors & Advanced Equipments.